Andalusia’s capital is a city rich with Moorish heritage. This is visible in everything from the colourful painted tiles that adorn many buildings, to the lobed arches of the palaces and of course the iconic Giralda tower, which was once a minaret. Three of the things most associated with Spain are also typically Sevillian: Flamenco, tapas and toros! Come in spring, when the aroma of jasmine and orange blossom carries on the breeze, and you can catch either the atmospheric solemnity of Semana Santa or the raucous merrymaking of the Feria de Abril. Seville Cathedral – This enormous structure is like a little world on its own, and you will lose hours staring in awe at the beautiful architectural flourishes, relics and historical curios. With 80 different chapels it’s the largest cathedral in the world by volume and is a World Heritage site. There are also hints of the mosque that once stood on this spot, especially in the Court of the Orange trees on the north side, where Muslims once performed ablutions. The big photo opportunity inside is definitely the tomb of Christopher Columbus, but there’s something spectacular at almost every turn. La Giralda – An enduring emblem for Seville, the Giralda is the bell-tower right next-door to the Cathedral, and you can purchase a ticket for both attractions. It has Moorish origins, being the minaret for the former mosque. What’s unusual about the tower is that 34 ramps lead to the top instead of a stairway. This was so that Muezzin who led the call to prayer could ride his horse up the tower instead of walking. To break up the monotony of the climb there are regular archaeological exhibits on the way up. And at the top the view is even better than you could hope for. Real Alcázar – This is a UNESCO-listed palace complex that is still in use by the Spanish royal family: their chambers, state rooms and halls are on the upper level and can be viewed if you pay a little extra. Nearly all of the complex is in the Mudéjar style (Moorish-inspired architecture for non-Islamic buildings) and was developed by Pedro the Cruel during the 14th-century. There are small glimpses of the original Almohad palace on the Patio del Yeso, for instance. On a visit you’ll walk from courtyard to beautiful courtyard, look up at carved coffered ceilings and surround yourself in the lush greenery of the sprawling gardens. Fine views of the grounds can be had from the elevated Grutesco Gallery. 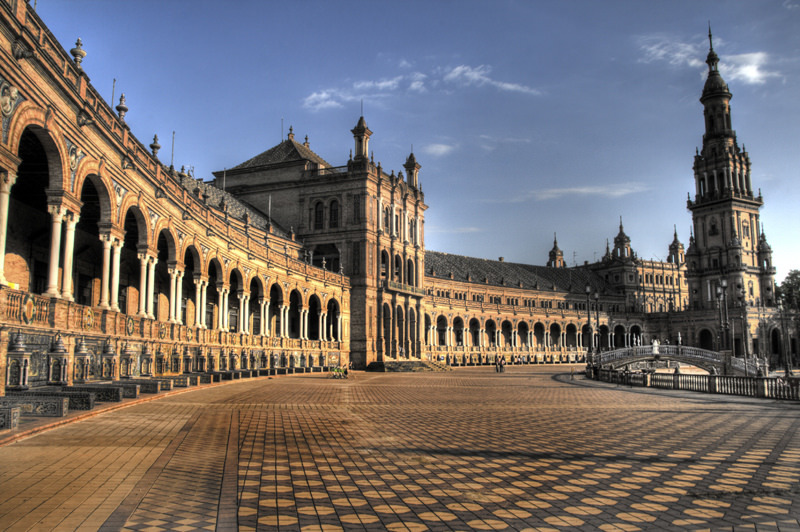 Plaza de España – This colossal monument was built for the Ibero-American Exposition in 1929 and stands within the Maria Luisa Park. It’s a semi-circular plaza edged by a canal and overlooked by a large, curved palace. The palace contains many of the city’s administrative buildings, but the reason to visit is to walk beneath the gallery. You’ll see busts of important national figures but also little installations for every province in Spain. Using typical Sevillian azulejos (painted tiles) these displays showcase details like the local food and famous monuments in each part of the country. It’s like a quaint geography lesson and will hold your attention for a good few minutes. Maria Luisa Park – The largest green space in central Seville originally belonged to the nearby San Telmo Palace, dating to the 1500s. In the late-19th century the grounds were donated to the city by Infanta Luisa Fernanda and took their present shape after a remodel in 1911. Maria Luisa is one of those parks with a pleasant surprise down every path, whether it’s an ornamental pond, pavilion, sculpture or tiled fountain. The park’s broad avenues have twin-rows of tall palm trees, while the body of the park, woven with little trails, is a large botanical garden with unusual species from around the world. Triana – On the left bank of the Guadalquivir, opposite the old city is the Triana neighborhood. This part of the city is credited for many of the things people associate with Sevillian culture, like painted ceramics and flamenco. The main way in is via the Isabel Bridge close to the bullfighting arena. You’ll arrive at the Plaza de Altozano, which has a much-photographed statue of a flamenco dancer, a “monument to the flamenco art”. Check out the area’s Moorish revival and baroque architecture and pop into one of the many tile and ceramics shops for authentic azulejos tiles. Right Bank of the Guadalquivir – Starting at the Isabel Bridge you can set off on a very enjoyable riverside walk south towards the University of Seville. On a sunny day Seville’s residents will be out for walks, riding bikes, jogging or sitting on the stone walls looking across the water to Triana. You can come off the riverside to see the Plaza de Toros, the 250-year-old bullfighting arena. Further down is the Torre del Oro, an ornate watchtower erected during the days of the Almohad Caliphate in the 13th century, now housing a maritime museum. Tablaos and Flamenco Shows – No matter the time of year you can be sure that there will be flamenco shows happening across the city on any evening. A tablao is a good way to watch a show, with live musicians and either a bar or restaurant service. If you’re staying near the Cathedral then Tablao El Arenal would be a good option, with two performances a night (each lasting 90 minutes) and a choice of tapas or full dinner. People visiting Seville in spring or autumn can catch the Peñas de Guardia, a series of shows organised for local or up-and-coming flamenco talent. Archaeological Museum – This attraction is part of ensemble built for the Ibero-American Exposition, collecting the most important artefacts from the archaeological sites around the Seville Province. The most exciting finds are from the Bronze Age: For example, dating to the 8th century BC is Treasure of El Carombolo. This hoard belonged to either the local Tartessos Culture that lived on the banks of the Guadalquivir River, or to the Phoenicians. It’s a hoard of 21 pieces of gold jewellery, and after replicas had been on display for many years the original items were installed in 2012. Museum of Arts and Traditions – Also part of the Exposition is this surprisingly diverting museum covering Seville’s traditional industries, households and customs. Here you’ll see everyday items from throughout Seville’s history, including ceramics from the 16th-century and large displays of swords and knives forged in the city. One section leads you through the various workshops relating to Seville’s historic trades, such as tile-making, metalwork, lacework and barrel-making for the local sherry (fino). Feria de Abril – Southwest of Seville, in Los Remedios, are the fairgrounds where this five-day event takes place, beginning on the Tuesday and wrapping up with fireworks on the Sunday. The scene will almost knock you off your feet, where some thousand tents are erected and guys and girls go around in traditional costume. The women will wear the “traje de gitano”, typical polka dot flamenco dresses, while many men will wear the short waistcoats and wide-brimmed hats. During the Fair people will eat, drink and dance traditional Sevillanas until dawn. Early evening there’s fun for kids at the fairground, with horseback rides and classic fair amusements. Semana Santa – The Holy Week processions in Seville are Spain’s most famous. From Palm Sunday to Easter Sunday sombre penitents will march through the streets wearing sandals, robes and those slightly eerie pointed hoods. These groups belong to brotherhoods attached to churches across the city and will carry large and very decorative floats portraying passion scenes and weeping Virgins. Everything builds up to Maundy Thursday, when the city’s central plazas put up grandstand seating and women attending even dress in black. On this night the processions make their steady way around the centre until the morning. Italica – Get on a bus at the station at Plaza de Armas and within half an hour you’ll be at the birthplace of the Roman Emperors Trajan and Hadrian. Italica is a massive archaeological site, the highlight of which is the amphitheatre. This seated 25,000 spectators in its heyday, and you can nose around the tunnels beneath the terraces of seating, and see the subterranean structure at the centre of the arena. On what would have been the seats of the ancient city are the foundations of mansions and temples, where complete mosaics can still be seen. Tapas – Seville is the home of tapas, and the alleys and twisting streets around the Cathedral, Ayuntamiento building and the riverside have tons of tapas bars. What’s fun is the way many of these joints will have one or two specialities, so an evening can be a crawl from bar to bar, with something delicious to try at each stop. This can be patatas bravas (spicy potatoes), chipirones (deep-fried baby squid), queso manchego, cured ham, oxtail stew, and prawns with garlic. One sit-down restaurant that is turning heads at the moment is La Brunilda on Calle Galera with exquisitely-presented little dishes that add some modern flair to traditional favourites like ham croquettes and pulpo (octopus).